I'm no expert, but that statistic indicates something is wrong. It is well documented that lawyers suffer from depression and problems related to stress and depression at rates greater than the general public. A recent column in the Wall Street Journal by Dr. Stephen Ilardi, Why Personal Tech Is Depressing, noted that the U.S. is the most technologically developed country and the most depressed. Three in 10 Americans will battle depressive illness in their lifetimes, an estimated ten-fold increase since WWII. Today's personal technology can be quite isolating, notes Dr. Ilardi. I don't have access to the full WSJ article, but here is a blog post about the article containing some of its suggestions. The Economist just published a feature Teenagers are Growing More Anxious and Depressed - Could they hold the culprit in their hands? Lawyers are not teenagers, but many seem just as attached to their smart phones. Many, if not most, lawyers have had the experience of being in a really good mood--until they check their email with their smart phone and find one of those emails. I do think there is something to smart phones and social media having a negative impact on the lives of frequent users. Each of us might wonder just how many opportunities we have missed out on while buried in our phones. Maybe it was not seeing an old law school chum in the courthouse hallway or wasting just enough time on the phone that you decided not to go out and participate in some activity. I recently heard Brian Cuban, author of The Addicted Lawyer, tell his story at the OBA Annual meeting. His presentation was interesting and compelling. I have not yet read his book, but I am certain it is fascinating and helpful. It is the holiday season and it is good to remember that many people struggle with negative emotions during the holiday season and almost everyone will experience some holiday stress. Knowing others deal with similar issues can bring some comfort. But lawyers are very independent and sometimes do not ask for help when they need it for fear it could be seen as sign of weakness. Most bar associations and law societies have lawyer assistance programs available to help. So this holiday season, try to spend less time staring at the phone in your hand and more time interacting in person with others. And, if you need help, or know someone who may need help, don't hesitate to reach out. That could be the best gift you can give a loved one, a friend, a colleague or yourself. A feature in the New York Times this weekend, The Lawyer, the Addict, is a compelling read, made so in large part by the writer's viewpoint from outside of the profession. Those of us in the profession have repeatedly heard the statistics on lawyer depression, addiction and suicide. In every one of those areas our profession ranks worse than most all others. Many of us have lost colleagues to depression and suicide. Lawyers have offices where others bring in their stress, their problems, difficult situations, threats they are concerned about and other such matters. Lawyers are there for every death sentence passed in a criminal trial, but we are also there for corporate "death threats" as well. We even have a name for it- the "bet the company case." But I think this story of Peter, dying from the impact of his drug addiction while still maintaining appearances as a partner in a high-powered law firm, breaks some of our assumptions about what addicted lawyer behavior looks like. His last call from his death bed was to call in to a scheduled conference call. I've never met Marty Solomon, but his 50 tweet "tweet storm" response to the article is worth a read, too. I have no great wisdom to share on this critical topic today. But it bears repeating to say, if you are in trouble, reach out for help. Many bar associations provide crisis counseling to members now. The Oklahoma Bar Association provides 24 hour free crisis counseling to its members, who can call 800-364-7886 any time day or night. There are other community resources for many situations. Ask for help if you need it. There is clearly a difference between a lawyer who shows up at work at a law firm employing hundreds of lawyers and scores of support staff and a lawyer who shows up at his or her solo practice and greets his or her legal assistant, the only other employee of the practice. While those differences still exist, today the lawyer's personal skill set for success is becoming a more similar regardless of firm size. At least that is my observation as outlined in Large- and Small- Firm Lawyers: New Similarities Emerge, my column in the November-December issue of Law Practice Magazine. Hopefully this will help lawyers assess their skills. A young lawyer named Benjamin S. Wright followed me on Twitter today. That is not news. I tweet and re-tweet a lot of law practice management tips and every reader of my blog should be following me on Twitter. You can go to my Twitter account and do that right now. (Shameless self promotion mode now turned off.) Mr. Wright recently left his fledgling private practice to take a position as an attorney editor with the State Bar of Wisconsin. He recently wrote something for their Young Lawyers publication that is not only worth reading for lawyers of all ages, but people of all ages. My Struggle for Perfectionism: The Myths and Realities of Being a Young Lawyer is a great read, about a topic which covers one of the challenges facing our profession. I sometimes joke to audiences that one of the problems with being a lawyer is we only have two standards of conduct: perfection and malpractice. That often gets a chuckle, if not a very loud chuckle. But that is how many lawyers feel. We acknowledge our imperfections as human beings, but we also have the professional standard that all legal work should be error-free. Perfectionism, in psychology, is a personality trait characterized by a person's striving for flawlessness and setting excessively high performance standards, accompanied by overly critical self-evaluations and concerns regarding others' evaluations. It is best conceptualized as a multidimensional characteristic, as psychologists agree that there are many positive and negative aspects. In its maladaptive form, perfectionism drives people to attempt to achieve an unattainable ideal, and their adaptive perfectionism can sometimes motivate them to reach their goals. In the end, they derive pleasure from doing so. When perfectionists do not reach their goals, they often fall into depression. I will note in passing the higher-than-average rates of depression, substance abuse and suicide within the legal profession. "Perfect is the enemy of good' is an often-quoted principle relating back to the time of Voltarie. Many business management books talk about the concept of "good enough," contrasting it with the pursuit of perfection that actually drives down profits. I'm not about to try and convince lawyers that their legal work shouldn't be perfect. We all know it should be. But take a few moments to read some wisdom from a young lawyer in Wisconsin and try to make sure that your entire life is not ruled by perfectionism. Those fine folks from AttorneyatWork asked me to offer some reflections on my thoughts after ABA TECHSHOW. Since I had already written one such piece for the Oklahoma Bar Journal (soon to be published- watch this blog or the bar journal), I had to decline of course happily accepted, not exactly knowing what I was going to write. But ABA TECHSHOW is always an inspiration, especially for someone like me in the legal technology field. So I collected my thoughts and the result was Pearls of Legal Technology Wisdom for Solo and Small Firms. I'm quite pleased with this and thank AttorneyatWork for the opportunity. I am pleased to call Merrilyn, Joan, Mark and Joy my friends. They are the brains behind this great resource that has the simple and challenging mission of publishing one great law practice tip per work day. I trust someone will receive some value from my contribution today and if someone is encouraged to attend ABA TECHSHOW 2017, that will be even better. Sometimes life (and law practice) can be a grind. But often it is all about your attitude. Here are a few tips for escaping the negative feelings of being in a daily grind. "An ancient bit of large law firm wisdom was that there were three types of lawyers: finders, minders and grinders." That's how I start discussing coping with the feeling like you are in a grind. Follow the link to read the rest of my Oklahoma Bar Journal column, The Grind. Toward a Less Stressful Workplace is my column in the January/February 2015 issue of Law Practice Magazine. Law offices often deal with very high stakes matters under strict time deadlines. 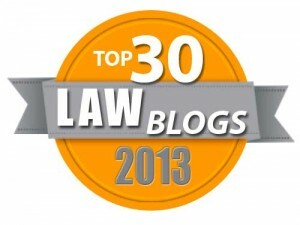 It is not news to those in the legal profession that there is a lot of stress associated with being a lawyer. So there may be nothing earth-shattering for you in these tips. But it is the beginning of a new year and aiming for less stress in your life and the lives of your coworkers has to be a good thing. So read and feel free to share. And the "more clients" part? Well this issue is the marketing issue of Law Practice magazine. Marketing is about getting more clients and better clients. The first feature is a three part discussion on branded legal networks. So if you are not sure what those are or how they relate to you, this may be a great magazine for you to read − virtual cover to virtual cover. Note: If you are an ABA Member, you can join the ABA Law Practice Division to receive the physical magazine or if you are not in the ABA, you can always subscribe to the magazine. Every year about this time, Sharon Nelson and I do our fun annual tech toys podcast. This year's edition is ‘Tis the Season: Tech Toys for the Holidays 2015. Some of these tech toys are related to the legal profession, but most are just for fun. For example, many backyard grillers might like the Steakchamp Thermometer and the Bosch eBike sounds like fun for anyone. (Links to all of the tech toys are located on the podcast site.) With all of the anticipation about the new Star Wars movie coming out in December, even the big kids might like a Darth Vader or R2D2 handheld shower head or perhaps a Star Wars Speros BB8 drone rolling around their homes. We enjoy doing all of our podcasts, but this one is special and we hope our listeners think so too. Our friend Reid Trautz also posted his 2015 Holiday Gift Guide for Lawyers this week. He includes some tech toys as well. 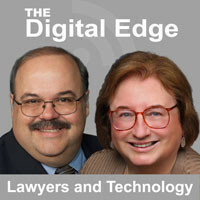 Our Digital Edge podcast this month is titled "How Lawyers Can Do More in Less Time" and features Allison Shields. Allison is co-author, with Daniel J Siegel, of the book from the ABA How to Do More in Less Time: The Complete Guide to Increasing Your Productivity and Improving Your Bottom Line. Allison and Dan would no doubt love for you to buy a copy of the book. But Sharon Nelson and I were interested in seeing how many time saving tips we could get Allison to volunteer for our listeners on our podcast. It is not just lawyers who struggle with time management. I talk to lots of people who feel like there is not enough time to get everything done. But the stress of lost time seems more acute when you are billing for professional services. Allison has some nice tips that we all can use. Technology advances have given us many ways to do things more easily and quickly. But the Internet has also provided us with ample distractions to take up any spare time. Focus and planning are keys to better productivity. So why not spend a few minutes focusing on our podcast with Allison's tips?